Alcock and Brown's famous first non-stop Transatlantic crossing on 14/15 June 1919. Brothers Capt Ross Smith and Lt Keith Smith's flight from England to Australia was accomplished between 12 November and 10 December 1919. Col Pierre van Ryneveld and Capt Christopher Quintin Brand flew from London to Cape Town between 4 February and 20 March 1920. They crashed along the Nile, returned to pick up another Vimy in Cairo and made it as far as Bulawayo before crashing again. They completed the flight in a de Havilland DH-9. The rebirth of the Silver Queen and re-enactments of its epic voyages were organized by the same team which produced the widely successful Vimy 1994 flight from London to Australia, which was featured as the cover story in the May 1995 edition of National Geographic. 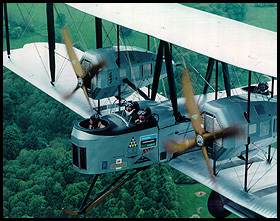 In the Spring/Summer of 1999, the Silver Queen re-enacted the pioneering flight from London to Cape Town by Pierre van Ryneveld and Christopher Quintin Brand which completed two of the three great Vimy flights of 1919 and 1920. The complex tasks of flight operations and logistics have been safely managed by Mark Rebholz, over five war zones, around a hurricane, and through miles of red tape. And to complete the Vimy "Triple Crown," the Vimy Aircraft Project has tentatively scheduled a re-enactment of the Transatlantic flight for the Summer of 2003. On these pages, you can learn more about the original and re-enacted flights, through articles and first-hand accounts written by the pilots.